Be the first to share your favorite memory, photo or story of Merlyn. This memorial page is dedicated for family, friends and future generations to celebrate the life of their loved one. Merlyn J. Eickman, 90, Pecatonica, IL died at 11:45 a.m., Thursday, March 14, 2019 in Pinecrest Nursing Home in Mt. Morris, IL. Born September 12, 1928 in Seward, IL, the son of Mr. and Mrs. John and Ella (Timrotte) Eickman. He attended Seward School from 1st grade to 10th grade and graduated from Leaf River High School. Married Audrey Potter and then married Eunice A. Carlson on July 31, 1964; she died d January 15, 2003. Merlyn then married Marilyn Marshall in February 18, 2006. He owned Eickman’s Processing Company, Inc. in Seward, IL. He was a member of First Congregational Church in Pecatonica, America Association of Meat Processor, Illinois Association of Meat Processor; Pecatonica Rotary Club, Pecatonica Fire Department Board of Trustees, A.W. Rawson Masonic Lodge #145, Scottish Rite Bodies in Freeport, IL, Tebala Temple, Twelve Mile Grove Cemetery Board, Illinois Board of Livestock Commissioners. Funeral ceremonies will be held at 11:00 am, Thursday, March 21, 2019 in First Congregational Church, 633 Reed Street, Pecatonica, IL with Pastor Duane Hoffman officiating. Burial will be in Twelve Mile Grove Cemetery, Pecatonica, IL. 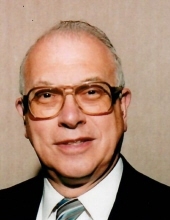 A visitation will be held in McCorkle Funeral Home-Pecatoncia Chapel 203 West 5th Street, Pecatonica, IL from 4:00 pm to 8:00 pm, Wednesday, March 20, 2019 with a Masonic Service to be held at 7:45 pm. Memorials may be given to the Pecatonica Fire Department 1221 Main Street, Pecatonica, IL 61063 or your favorite charity. To send flowers or a remembrance gift to the family of Merlyn J. Eickman, please visit our Tribute Store. "Email Address" would like to share the life celebration of Merlyn J. Eickman. Click on the "link" to go to share a favorite memory or leave a condolence message for the family.